13 Feb Logan Farm Park Expansion – NOW OPEN! Logan Farm Park is an approximately 120 acre park located in the center of the city. 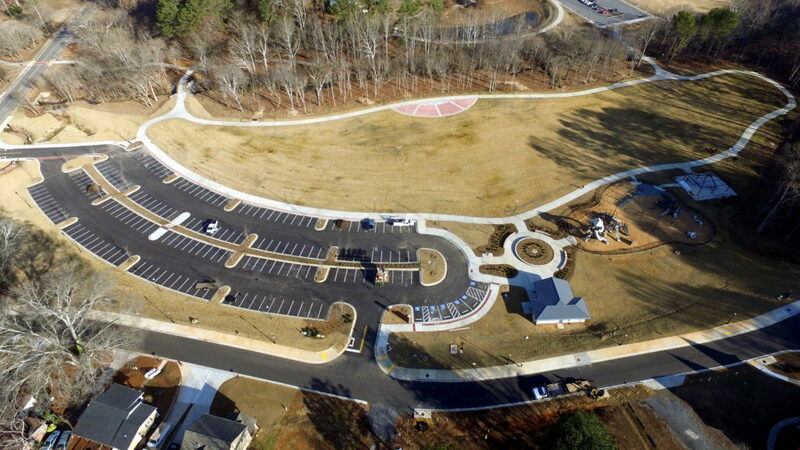 Previously, the park encompassed a lighted 1/3 mile walking trail around a multipurpose recreation field with the trail also extending to Cowan Road and Cherokee Street, playground, public restrooms, Amos Durr Community Ball Field, Roberts School Community Center and the Rosenwald School. As part of the SPLOST park improvements, the city has developed another 15 acres of parkland along Cherokee and Taylor streets to expand the park. This new expansion adds additional multi-use pathways, open green space, a destination playground, group pavilion, restroom facility, and parking. The grand opening of this expansion was on Tuesday, December 20. This new park is a wonderful addition to our downtown and has already become one of the most heavily used parks in the city! Make sure to bring the family and check out this beautiful new location when you visit Acworth!